PWCCC-AP2-K12 - Password JDM Carbon Kevlar Center Console - Pann Auto Performance - San Diego largest aftermarket automotive performance parts - What do you drive? Introducing the PWJDM Dry Carbon Kevlar Center Console… The PWJDM Dry Carbon Kevlar Center Console is the best there is! Engineered in house for a perfect fit and finish without the use of any hardware, the PWJDM Center Console does volumes for the look of your interior. This item is 100% hand crafted here in the USA. What differentiates the PWJDM Dry Carbon Center Console from just about anything else in the market place is that ours is made entire of Dry Carbon Kevlar and wraps around behind the seat for that perfect look. It would have been impossible to make this out of cheaper wet carbon and still maintain this level of fit and finish… This is why PWJDM will only produce in dry carbon Kevlar . This center console fits like a glove and with a retail price of only $449.99… you won’t find a cleaner looking upgrade for your interior at any price. 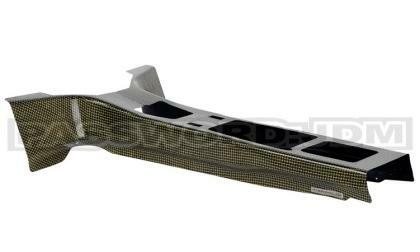 If you own an AP1 S2000, the Password:JDM Dry Carbon Center Console will fit your vehicle, but you will need to purchase the AP2 S2000 center console cover to cover all trim lines. This may be purchased through your local Honda dealer.